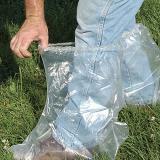 These plastic boot covers provide a sterile plastic barrier so that you neither spread disease to other farms nor bring organisms home from somewhere else. 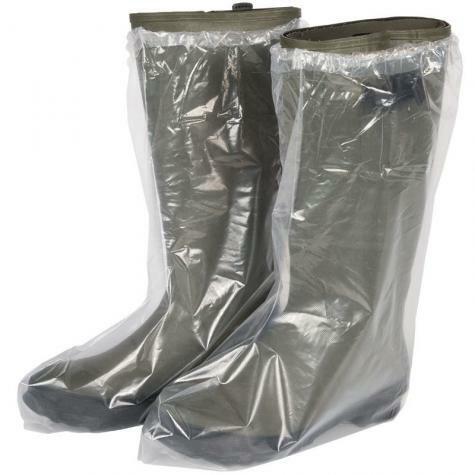 Package of 50 individual plastic boot covers. Most plastic boot covers tend to fall off but this version has elastic around the top to keep them in place and dirt out of the sole area. Every farm should keep these around. Stop spread of disease etc. or just keep visitors shoes clean. These are wonderful to protect your farm and shoes. They work very well and are easy to put on. Love these disposable boots. We photograph at farms and spent way too much time cleaning off boots from farm to farm to avoid the spread of any disease. We live in the city so don't have farm shoes we place outside and wear only at one location. These are just wonderful. We could go outside the country and use these as well as they weigh nothing and are disposable. Company was prompt in mailing our order. Much more sturdy than expected. Elastic band is great.